If a microwave dinner conjures up images of Styrofoam noodle cups, sodium-filled meals for one, and all-nighters to finish a paper you'll definitely remember five years later, then you're doing it wrong. You shouldn't be relegated to a life of processed food and scurvy. Luckily, a microwave can be a valuable tool to cook up delicious, satisfying dishes that are actually good for you. These recipes may require a little more effort than poking a plastic cover with a fork, but they're still pretty simple -- and the finished culinary creations are totally worth it. Cauliflower does a great job of disguising itself as other delicious foods, and this "mac" & cheese recipe is no exception. The cauliflower is cooked to a tender texture, and when covered in cheese, creates a healthier, gluten-free pasta alternative, especially for those who are keto. Get the recipe here. Breakfast can be enjoyed any time of the day, and with a microwave-safe mug and carton of eggs, you can whip up a tasty omelet in no time. This protein-packed breakfast (or lunch or dinner) is made in minutes, and you can throw in your favorite veggies for a healthy kick. Grab your favorite mug and make the recipe here. A home-cooked dinner made in a coffee mug? It is possible, thanks to fresh lasagna sheets (you can find them in the refrigerated section at the grocery store). Use as many or as few as you like, depending on how starchy you prefer your lasagna. Layered with fresh veggies, herbs, tomato sauce, and ricotta, this recipe is the fanciest thing you can zap in less than three minutes. Find the recipe here. Again, coffee mugs to the rescue. This time, they're used to whip up a tasty breakfast (or snack) that's chock-full of antioxidant-rich berries and rich apple flavors. The egg adds a bit of protein to the healthy carbohydrates, and cinnamon and vanilla make it a little fancier (and healthier!) than those single-serve microwave oatmeal packets, which are usually full of artificial ingredients and sugar. Get the better-for-you alternative here. 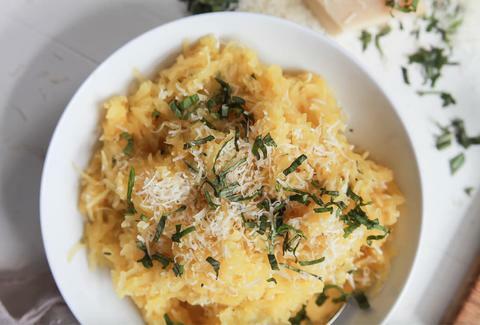 For vegetarians, or someone looking for hearty pasta flavor without the carbs and extra calories, spaghetti squash is a perfect meal staple. And it can be cooked to a tender texture right in the microwave! The recipe takes less than 20 minutes to make, and with fresh toppings like olive oil, basil, and Parmesan cheese, it feels like a home-cooked plate of pasta. Make it here. Risotto isn't just for nice Italian restaurants; you can totally hack it at home with some Arborio rice and a microwave. Get creative with ingredients, like mushrooms and thyme or garlic and white wine, to feel like a culinary wizard. Find all the flavorful combinations here. For a hearty dinner that also happens to be gluten-free, these enchiladas are the perfect option. Although the recipe requires a little patience, the convenience of cooking them in a microwave-safe dish, and the fact that you'll have enough to share or last you a few days, make the result totally worth it. Add some shredded rotisserie chicken for protein, or leave it out for a vegetarian option. Get the recipe here. There are few things more comforting than a fully loaded baked potato on a cold winter night. Especially one that doesn't require any kind of baking or stove-top cooking. These baked sweet potatoes have a Mexican flare with a homemade black bean salad (also warmed in the microwave), and the fiber from the beans and sweet potatoes will leave you feeling satisfied. Find out how to make it here. Christina Stiehl is a Health and fitness staff writer for Thrillist. She still manages to burn food in the microwave. Follow her on Twitter @ChristinaStiehl.